The cookie stores the website session ID meaning that the session and activity associated to the session can be identified. Nothing on the website would work without this. The cookie enables you to access secure pages on our site. Without this any secure content such as signing in and checking out cannot be completed. 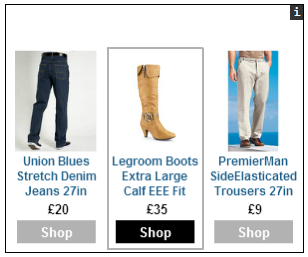 This enables you to use our share bag facility in order to shop across different websites. There are a number of cookies we use that we do not own or control. The company in question controls how their cookies are set. Various cookies are used by the list of companies listed that are needed to perform various tasks such as displaying secure images, tracking customer behaviour usage and statistical gathering. In order to present relevant adverts we think you may be interested in, certain cookies are used to facilitate this. These are detailed below. These cookies are used to track DoubleClick campaign activity that we operate via pre-site paid search advertising and post-site targeted adverts. Click on "Tools" at the top of your browser window (use the cog icon in IE 9.0 & 10.0) and select "Internet options". Click on the spanner icon found at the top of the browser screen. If not already chosen click on the "+Show advanced settings" link at the bottom. Just under the Privacy section click on the "Content settings..." button. You now have a choice to either disable all cookies by ticking "Block sites from setting any data" or disable only 3rd party cookies by ticking ?Block third-party cookies and site data?. Click on "Tools" at the top of your browser window and select "Options". In the popup window select the "Privacy" option. Now under the History section click the drop down box alongside "Firefox will:" and then choose "Use custom settings for history". You now have a choice to either disable all cookies by unticking "Accept cookies from sites" or disable only 3rd party cookies by unticking "Accept third-party cookies". Click on the Cog icon at the top of your browser window and select the "Preferences". Click on "Security", then check the option that says "Block third-party and advertising cookies". As mentioned previously we use specialised 3rd party analytics partners. One of our analytics partners is Coremetrics. You can opt out from having your data collected by Coremetrics. A further analytics partner we use is Celebrus. You can opt out from having your data collected by Celebrus. Our aim is to present to you, relevant products at a competitive rate via the third party. If your decision is not to display this type of advertising you are able to opt out of this service either by 2 methods. Firstly by clicking the "i" symbol found in the corner of the actual advert or secondly visiting the behavioural advertising website. Here the site will run a check to see what your current cookie status is set to and how to change that status. Also the website gives you information specifically around how advertising works online. Both these methods will set your browsing device. If you decide to remove all your browser information including cookies the adverts will appear again as the information will have been lost.